Because I can’t heal the hind legs of my old dog who can barely walk this morning. Or put a bandaid over the overflow of anxiety bursting through my seams. Because, in this moment, folding the clothing in my basket feels hard. And my to-do list is a mile long. Because I woke up grieving the feeling of my Grandmother’s fingernails scratching my back, soothing me as I fell asleep. And I’ve already dropped my computer once today. I am organizing the square foot of ground that I’m standing on. 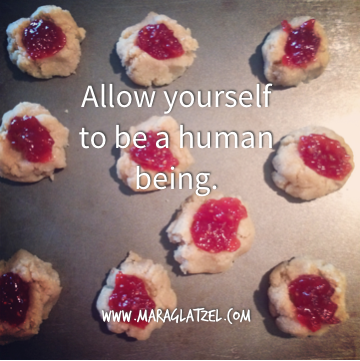 I’m reaching out to my sweetheart, sharing my rough edges and vulnerability. Loving yourself doesn’t mean that every moment is easy. It isn’t a journey with a destination or a permanent get-out-of-painful-situations card. We don’t do this work in the hope that it will make everything perfect, but instead, so that we have access to our own reservoir of inner strength when things feel difficult. It is the process of living in your body and fully inhabiting your skin, for better or worse. It is the process of digging deep to find the joy in the cracks and crevices, holding onto each and every silver lining with both hands. It is the decision to prioritize anything and everything that makes you feel whole, alive. It is the slow process of washing the dishes before you make your breakfast or scrubbing your bathtub before you immerse yourself in the hot water. It is drinking a(nother) glass of water instead of forcing yourself prematurely out of your slow grief with a(nother) cup of coffee. It is giving yourself permission to move at your own pace, intentional in your desire to ply yourself with resources and the warmth of your own love. It means that when you feel low and nervous, you add value to your day by thinking the thoughts that support you, nourish you – instead of piling pain upon pain and digging deeply into negative self-talk. Yes, maybe you could have done better. Yes, it could have been more graceful. Yes, you might be overreacting. Yes, others might perceive you as being too sensitive. Yes, there are tasks that you could/should attend to. But, you are a human being. You deserve the space and kindness that you are aching for. You deserve the same love and respect and care that you would give to someone that you truly loved. Grief knows no timeline. Pain can bloom in the pit of your stomach in an instant of remembering. You may be able to hold it all together for a few minutes, pearls on a string dazzling around your neck, and in the next moment, you might find yourself on your hands and knees scooping up the pieces, again. Loving yourself is the practice of cultivating safety in your relationship with yourself by consistently having your own back. It is the process of expanding the moments when you can hold a loving framework and finding the small bites of joy in the moments when you can’t. You deserve this kind of relationship with yourself, because it won’t always be pretty. And you will need your own kindness and compassion. It is the way that you hold the hope for yourself, the light at the end of the tunnel. Knowing that you are a good person who is having a rough day will heal you. Cultivating space for your distress and grief will allow you to move through it. Carve out this space for yourself today – no matter where you are or what you’re up to. Carve out the space to show up messy, to show up human. Know, deep in your heart, that in doing this you are taking beautiful care of yourself, and that is worthwhile.